Construction workers always find the best fossil sites. Over 30 years ago, some construction workers dug an 140 foot deep pit for a hydroelectric generator as part of the Santee Rediversion Canal Project. The purpose of the project was to reduce the amount of sediment flowing into Charleston Harbor. By happy accident, the pit cut through the Williamsburg Formation, a geological strata of Paleocene Age. Moreover, the Williamsburg Formation is overlain by Pleistocene Strata from the Penholoway Formation, so early Pleistocene specimens of horse, tapir, and alligator mixed with the Paleocene fossils. Collectors searched the excavated spoil piles and found all sorts of interesting fossils. The site gets its name from nearby Black Mingo Creek and is located in St. Stephen, South Carolina. Location of the Black Mingo Fossil Site. The Black Mingo Formation has been renamed and is now called the Williamsburg Formation. The Paleocene Era was an age of rebirth, following the K-T impact that wiped out the dinosaurs. The epoch began 65 million years BP and ended 55 million years BP. The climate in this region and in most of the world then was frost free. This particular site was likely a river delta surrounded by tropical evergreen forest dominated by pine and palm trees, though broadleaf trees were common too. Fossil collectors found logs, plant macrofossils, and pollen from many extinct species that belonged to well known families still extant. They excavated 6 species of palm as well as pine, cypress, fir, tupelo, magnolia, olive, beech, walnut, alder, hickory, myrtle, ephedra, chenopods, and lillies. However, all of the species of fossil trees found here are extinct at the genera level. Some may be ancestral to modern genera. Much of the fossil wood had borings made by now extinct species of insects. Ancient fossil wood of a Podocorpoxylon found in Italy. I couldn’t find any online photos of the fossil wood found at this fossil site in South Carolina, but one of the specimens was related to this one. There are some photos in the below referenced link. 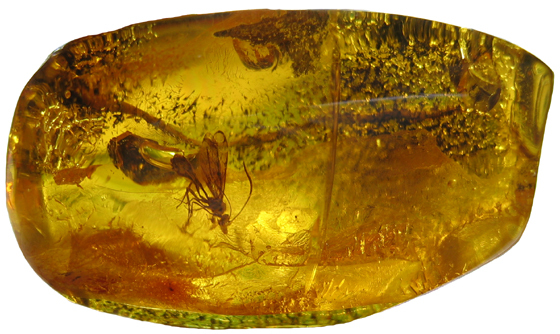 Scientists found lots of Paleocene-age amber at this site. Resins produced by conifer forests dripped into the river where it was quickly buried by sediment. Buried resin becomes copal and after 2-10 million years copal transforms into amber. Teeth from 13 species of sharks were deposited into this site. Most of these species are also known from the Cretaceous, proving the K-T impact did not cause many extinctions of sharks. Though the number of bony fishes surely outnumbered shark species in Paleocene oceans, only 7 species were identified here. Shark teeth preserve better than most fish fossils. Teeth from the extinct Paleocene shark–Cretolamna appendiculata. Turtle shells were by far the most common vertebrate fossils excavated from the site, equaling 60% of the total. Apparently, there was a complete turnover of turtle species from the early Paleocene to the late Paleocene, and the turtle fauna from this site included completely different genera (with 1 exception) from Paleocene fossil sites located in western North America. All of these turtle genera have become extinct. Three species of crocodylians that lived alongside Cretaceous-age dinosaurs continued to survive during the Paleocene. Crocodylians survived the K-T impact by taking refuge in watery holes they dug. Two of these species were long-snouted fish-eaters, but Bottosaurus had a broader snout and likely preyed upon a wider range of organisms. Scientists also identified many crocodylian coprolites collected here. Thoracosaurus skull. It was a 14 foot long crocodylian of the Paleocene era that mostly ate fish. This locality is the largest Paleocene mammal fossil site on the east coast of North America, though only 6 species were collected. There were probably at least 50 species of mammals that lived in the region then and hundreds of species of birds. Yet, few mammals and no birds were preserved via fossilization. Bird bones are hollow and easily crushed and hence rare in alluvial fossil sites. Most of the bird and mammal species that lived during the Paleocene became extinct without leaving a bit of fossil evidence. Primitive mammals, some ancestral to modern mammals and some that left no modern living representatives, were among fossils found here. 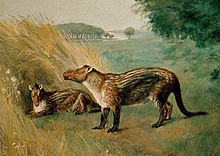 A condylarth–Phenocodon grangeri–is thought to be ancestral to ungulates, though at this early date they were likely omnivorous and less specialized for eating plants. Ectoginus gliriformes is described as a digging animal with “the body of an aardvark and the head of a pig.” The tooth of a caniforme (an animal ancestral to dogs, bears, and weasels) reveals the presence of a mammalian predator. Skeletel material from an animal possibly related to rabbits suggests Bugs Bunny’s ancestors lived here. Scientists have been unable to classify a couple mammalian species excavated here and have labled them “incertae sedis.” Without the discovery of more Paleocene fossil sites, our knowledge of this epoch will remain poor. Charles Knight’s illustration of a Phenacodos sp., one of the condylarths that are thought to be ancestral to the ungulates. Our favorite Thanksgiving foods are all of North American origin. Turkey, potatoes, sweet potatoes, pumpkins, most varieties of green beans, and cranberries were unknown in Europe and Asia before Christopher Columbus made first contact with Native Americans. Without the contribution of Native American agriculture our culinary repertoire would be destitute, also lacking corn, chocolate, vanilla, peppers, and perhaps most importantly, tomatoes. Tomatoes originate from a plant that grows wild in South America–Solanum peruvianum. It grows at mid-elevations where the climate is not too cold nor too hot. Unlike its cultivated descendent–Solanum lycopersicum–the wild tomato is resistant to disease and insect infestation. Some individual plants even exude a sticky substance on their leaves that traps insects and stops them from defoliating the plant. Ripe wild tomatoes. Some varieties of modern cultivated tomatoes are green when ripe. A green color in ripe tomatoes is considered a primitive trait. 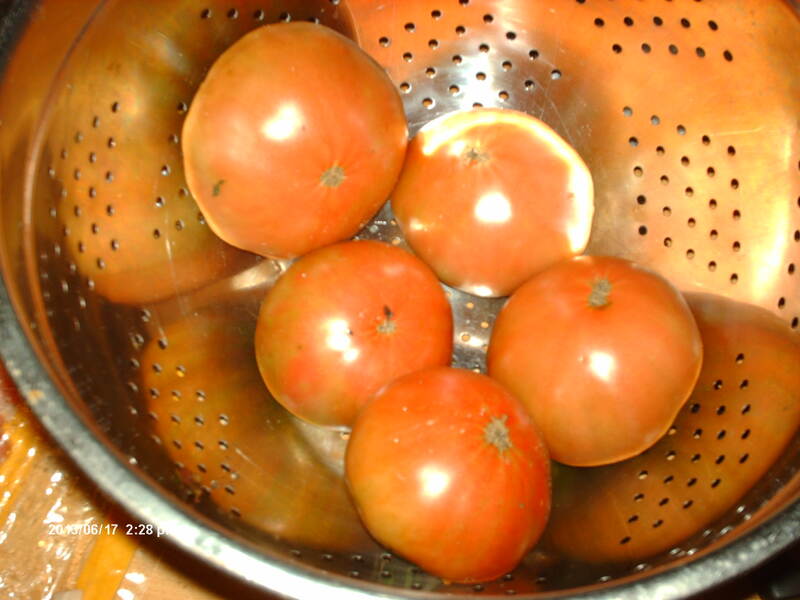 I harvested these Cherokee purple tomatoes late last June from my garden. They are an heirloom variety, meaning they produce true to seed. Most tomatoes sold in grocery stores are hybrids. 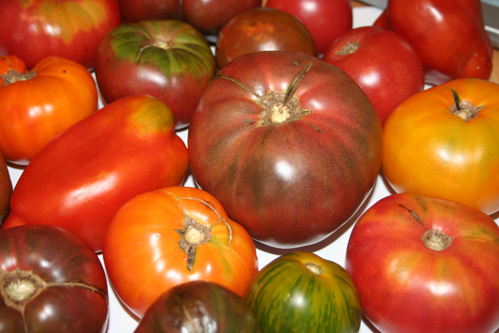 Despite garden catalogue propaganda, heirloom varieties are no better tasting than hybrids. I also grew Better Boy hybrids, and they tasted better. In previous years the Cherokee purple tomatoes tasted better than the Better Boys. The variation in flavor is influenced by soil nutrients, sunlight, and weather as much as by variety. Native Americans probably first found wild tomatoes growing as weeds in their corn fields. Good quality fruits were seasonal and rare in this region then, explaining why the early Peruvians would make a trial of eating these sour and bitter fruits. Occasionally, they found individual plants that produced more palatable fruits, and the seeds of these were saved and planted on purpose. About 2500 BP the Peruvian Native Americans colonized or conquered Mexico and carried seeds of this plant with them. This is where cultivation led to the development of what we would recognize as a modern tomato. A variety of heirloom tomatoes–all descended from the species of small green wild tomato pictured above. Horticulturalists still use wild tomatoes for crossbreeding with cultivated tomatoes to help strengthen disease and insect resistance. As every backyard gardener and truck farmer knows, tomatoes are inbred weaklings, susceptible to disease. Almost every tomato plant I’ve ever grown eventually develops some sort of blight. Horticulturalists hope to combine disease resistance of wild tomatoes with the good taste of cultivated tomatoes. Tomato horn worm (Manduca quinquemaculatata). It’s actually the larva of a large moth. I once read an article written by an idiotic gardening advice columnist who suggested gardeners only needed to look over their gardens once a week. A few of these hornworms can defoliate an entire row of tomato plants in about 3 days. I check daily and crush them on sight. The solanum genus also includes the Irish potatoes (Solanum tuberosum) and eggplants (Solanum melongena). The fruit of some other plants in the Solanidae family, such as peppers and husk tomatoes are edible, but others such as belladonna and nightshades, have poisonous leaves and fruit. This explains why it took centuries for Europeans to develop an appetite for tomatoes. Did the Yellowstone Volcanic Eruptions Cause Some Large Mammal Extinctions During the Pleistocene? Most people visiting Yellowstone National Park don’t realize they are standing over an active supervolcano that will destroy most of western North America the next time it erupts. Yellowstone National Park is located within 3 volcanic calderas created following 3 supereruptions that occurred during the Pleistocene. A volcanic caldera forms when the chamber that held all that hot magma empties and collapses into a crater-like landscape. The Yellowstone supervolcano erupted 2.1 million years BP; 1.3 million years BP; 640,000 years BP; and will erupt again at some unknown time in the future. Scientists have no way of determining exactly when this will happen, but the catastrophe will likely destroy the United States as we know it. 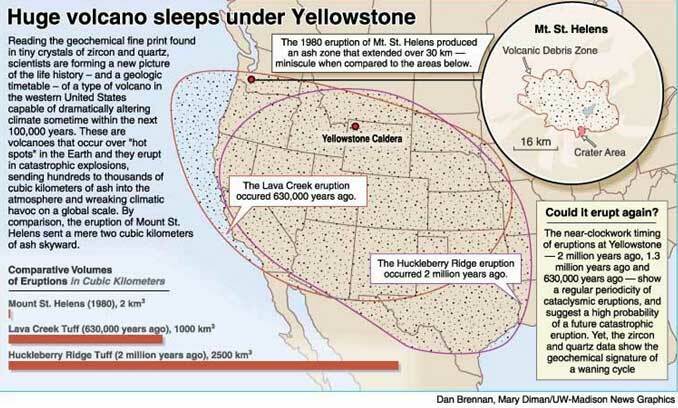 Diagram of the Yellowstone Supervolcano. 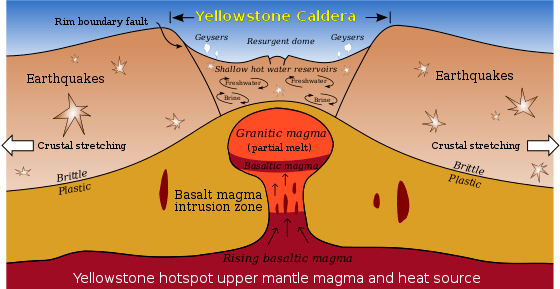 Diagram of Yellowstone calderas formed following 3 supereruptions and 1 regular eruption. Map showing how far a major ashfall occurs following supereruptions. Minor ashfall would occur over a much wider area. Scientists are unsure how the Yellowstone supervolcano originated, but they do know it’s a magma hotspot that has been in existence for 18 million years. It originally was located in what today is western Idaho, and as the continental plate moved west over this hot spot, its location has been shifting east-northeast so that now it is in northwestern Wyoming. Actually, the hot spot has stayed in the same place–it’s the continent that has been moving. There have been 142 caldera forming eruptions from the Yellowstone supervolcano, including 12 supereruptions. One supereruption occurred 10 million years ago and a foot of volcanic ash fell over a 1000 square mile radius. The volcanic ashfall preserved one of the best Miocene fossil sites in the world–the Ashfall Fossil Beds in Nebraska. 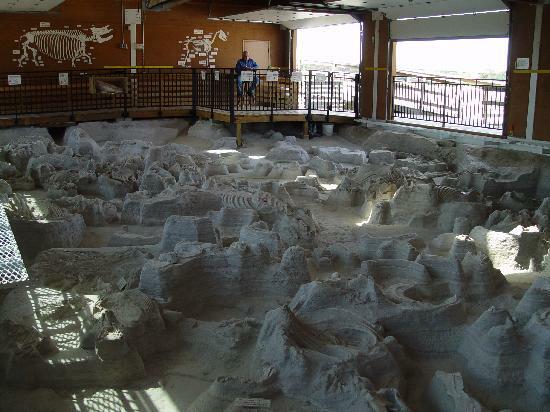 Inside the rhino house at the Ashfall Fossil Beds Historical Site. The ashfall from this supereruption preserved over 200 skeletons from 17 species including 5 kinds of horses, 3 kinds of camels, the hippo-like rhino (Teleoceras major), a saber-toothed deer, a raccoon dog, a fox-like canid, secretary birds, crowned cranes, a rail, giant tortoises, and a mud turtle. Gnaw marks on some of the bones are evidence the bone-eating dog (Borophagus diversidens) was a common predator in Nebraska during the Miocene. The large mammals survived the initial ashfall but died within 3 weeks from breathing volcanic ash. Volcanic ash consists of tiny shards of glass that eventually destroy lungs. The 3 Yellowstone supereruptions of the Pleistocene must have caused the extinctions of vertebrate and plant species that had a strictly western distrubution. Nevertheless, I haven’t been able to find enough information in the scientific literature to link corresponding extinctions with the 3 dates of the Pleistocene eruptions. It may be that there isn’t enough data to exactly date when most species became extinct. A decade after a supereruption, plants began recolonizing the ash-enriched soil from seeds and roots that survived inside the ashfall zone, and from plants outside the zone. Animals from north, east, and south recolonized the west and within centuries, the region was probably as rich an environment in wildlife as it was before the supereruptions, minus the locally confined species that were lost. The Yellowstone supereruptions impacted the rest of North America and even the world, though not to the catastrophic degree that devastated the west. Weather systems brought up to an inch of ashfall as far east as Georgia and Florida. This may have caused an increase in mortality among the wildlife here. The ash from the supereruption blocked sunlight, resulting in a volcanic winter when for several years freezing temperatures occurred during summer, and winter temperatures plummeted far below average. This phenomenon happened as recently as 1816 following the eruption of Mount Tamboro in Indonesia, a volcanic eruption that was much smaller than a supereruption. 1816 was known as the “year without a summer” and “eighteen hundred and froze to death.” In New England there was snow in June and a frost in August. The corn crop completely failed as far south as New York. (The last supervolcano to erupt on earth was located in Java. This eruption occurred 70,000 years ago and lowered earth’s temperatures for 1,000 years.) Volcanic winters following the Pleistocene supereruptions led to reduced plant growth and forest mast, resulting in significant wildlife mortality. But wildlife was resilient. Ground sloths and armadilloes stayed in their burrows, carnivores scavenged the animals that starved to death, and herbivores ate bark to stave off starvation til frost free summers returned. Pine and oak trees are especially resilient and could rapidly recolonized even the ashfall zones. Conifers continued to photosynthesize in low light conditions, while oak saplings germinating from buried acorns thrived in the sunny locations created in dead, shade-free forests. All of the plant and animal species with us today are ancestors of organisms that survived past catastrophes such as volcanic supereruptions. When the Yellowstone supervolcano next erupts, the human death toll will be in the millions. The death zone will resemble that of a nuclear warhead blast. Those living within hundreds of miles will be obliterated by the blast and lava flow. Those living within a 1000 miles will have to cope with lung-destroying levels of ash. Volcanic winters will disrupt the food supply. The U.S. government was incapable of helping survivors of the Katrina hurricane, a minor disaster compared to a volcanic supereruption, so no one should expect any help from the government. The United States and much of the rest of the world will splinter into hundreds of warlord-like entities, fighting over dwindling supplies of food in wars that will last at least a decade. Lots of people, including me, laugh at survivalists who stockpile food and guns. They will be the ones laughing after a volcanic supereruption when they roam through neighborhoods killing people and taking their food. Inside one of the paleoburrows studied by Heinrich Frank and his students. This one is so large it must have been made by a ground sloth. Be sure to click on the paleotocas link above for more photos. There are some photos of the claw marks on the sides of the tunnels but they were within pdf files that I couldn’t cut and paste to my blog. Within the last few years, Heinrich Frank has documented the discovery of 60 paleoburrow complexes of 1-25 tunnels each. The total number of paleoburrows includes 45 intact tunnels and 130 crotovines (tunnels that have become filled with sediment). Some are up to 60 yards long and many criss cross and are connected to other tunnels. Claw marks on the tunnel walls match 5 different species: giant armadillos such as Eutatus, Propraopus, and Pampatheres, and 2 giant ground sloths–Glossotherium and Scelidotherium. Scientists are still figuring out how to determine which claw marks match which species. It’s not as easy as one would assume because the nail part of the claw isn’t preserved, and the difference in size between males and females can throw off their calculations. For example the claws of a large male of 1 species may overlap in size from the claws of a small female from a larger species. Scientists must also consider 2 other large animals that could possibly dig burrows–bears and giant tortoises. The paleoburrows found in Brazil were dug into sedimentary rock, or more rarely, volcanic rock, and are located in hillsides not far from water. Amazingly, some are dug into sandstone. This shows just how powerful diggers ground sloths and giant armadillos were. A man would need a pick axe to dig through this strata. The ceilings of these burrows have a wave-like undulating pattern, indicating the animals dug, stopped, removed the dirt, and resumed digging. The burrows were “deepened episodically” and probably used by several generations. Burrows that are 6-10 feet in diameter were undoubtedly made by ground sloths. Armadillos made narrower burrows. Scientists working in these paleoburrows face many hazards. They can suffocate in the smaller burrows. The tunnels fill with water during rain, presenting a danger of drowing. Dust and fungi can carry lung diseases. Poisonous spiders abound here, while rabid bats and live armadillos infected with leprosy can also pass on their diseases to researchers. 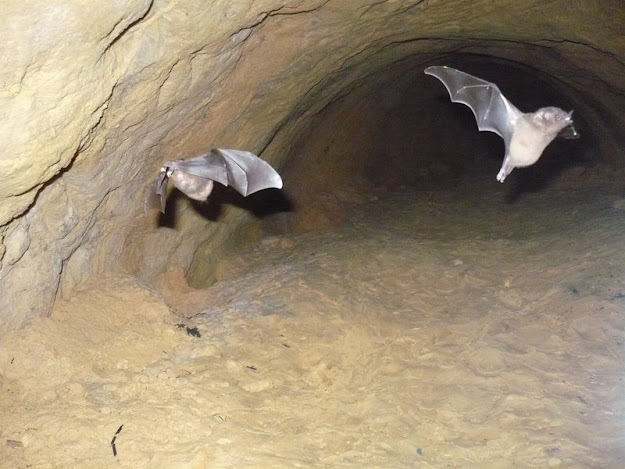 Rabid bats are a hazard for researchers studying paleoburrows. Ground sloths and giant armadillos primarily used burrows as shelters from the weather. Both belong to the primitive family of mammals known as the edentates. The edentates originated in the tropics and have poorly developed thermoregulatory systems. To survive, they had to escape from the hot midday sun and from freezing temperatures. Although no paleoburrows have been found in North America, their fossorial habit explains how one species, Jefferson’s ground sloth, was able to live as far north as Alaska. It must have dug deep burrows where it was safe from hard freezes. 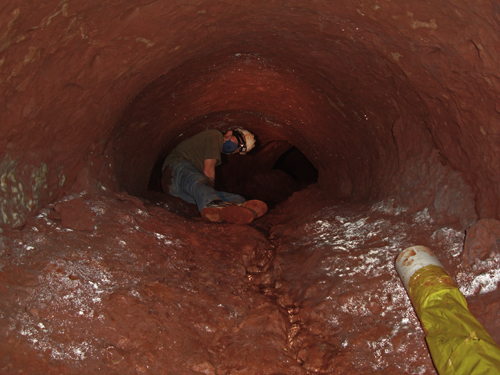 Heinrich Frank has asked North American cavers to be on the look out for paleoburrows, but so far, none have been found. Paleoburrows in Brazil and Argentina were dug into rock, and this is why they are so well preserved. In North America burrows were dug into soil where they likely collapsed and disappeared soon after ground sloths became extinct. Flamingo Bay is an ancient Carolina Bay located on the Savannah River Site in Aiken County, South Carolina. Over one thousand Carolina Bays pockmark the southeastern coastal plain of North America. Most were formed during cold arid stages of Ice Ages between 40,000 BP-7,000 BP, but Flamingo Bay is an older example of a Carolina Bay. Flamingo Bay originated about 108,000 years ago and was “rejuvenated” about 40,000 years ago. The formation of Carolina Bays is an interesting complex process. During Ice Ages dry climates prevailed in the south as much of earth’s water became locked in glacial ice. This caused peat swamps to dry and become susceptible to lightning-induced fire. The peat burned away creating depressions in the ground, and wind erosion enlarged these depressions. Southwesterly winds, much stronger than those of today, were a regular part of the weather pattern then. The southwesterly winds gave Carolina Bays their directional orientation which is northwest-southeast–perpendicular to the wind. Wetter climate phases turned Carolina Bays into shallow lakes, and ponded water pushed by wind eroded these bays into their characteristic oval shape. Carolina Bays were formed at the same time eolian sand dunes rolled across the landscape and the 2 geological wonders are often associated together. Carolina Bays have sandy lips. About 7,000 years ago, the water table rose to its present level and Carolina Bays became filled with water and stopped forming. Flamingo Bay is usually flooded year round but the depth is shallow, less than 3 feet, and during severe draughts it occasionally becomes dry. Aerial photograph of a Carolina Bay. Carolina Bays are of varying ages, debunking the claim that they resulted from a single extra-terrestrial impact. Ground level photo of Flamingo Bay. Flamingo Bay is 1 of many protected natural areas within the Savannah River Site. A beech-hardwood forest, an environment not normally found on the coastal plain, is another interesting protected natural area here. Late during the Pleistocene (about 13,000 BP), wind blew sand over a couple Clovis artifacts left next to Flamingo Bay. Archaic Indians left even more artifacts next to the bay about 10,200 calender years BP and again about 9,000 calender years BP, and wind blown sand from the bay covered these as well. Archaeologists from the Savannah River Archaeological Program excavated these artifacts a few years ago. They include points, blades, and scrapers; most made from Allendale chert (a type of stone) but 2 were made of victric tuff and 1 from quartz. Archaeologists, using microscopic examination, determined the tools were used for wood whittling, boring, and hide scraping. The tools were associated with burned hickory nuts and grape seeds, and gizzards stones (gastroliths) from birds they butchered. Apparently, the paleo-Indians of the late Pleistocene and the archaic Indians of the early Holocene both processed hickory nuts in pits next to the bay. Hickory nuts were an important item of their diet, providing much needed fat. Archaeologists used the burned hickory nuts for radio-carbon dating. (I translated these radio-carbon dates to calender years for this essay.) Paleo and archaic Indians heavily utilized the resources found near Flamingo Bay. The bay was likely surrounded by a rich hardwood forest that attracted game and waterfowl. Artifacts from later Woodland and Mississippian cultures have been found in this vicinity too but to a much lesser degree, so the site was not as important for them as it was for the more ancient Indians. Some of the artifacts found here had blood residue on them. Scientists are able to pair tiny amounts of blood residue with the type of animal it originated from but usually not to the species level. (I believe there’s not enough for DNA testing.) The residue is placed in a solution with a toxin, and the anti-bodies from the residue attack the antigen (the technical term for the toxin that binds with the antibodies). Scientists can then identify the class of antibodies and match it with the animal. The blood residue from the artifacts tested positive for bovine, deer, turkey, and another type of gallinaceous bird–either grouse or quail. The bovine blood likely came from a Bison antiquus, an extinct ancestor of the modern bison. The bovine blood residue was found on the Clovis artifact. Bison antiquus was the species of bison that lived in North America 13,000 years ago. It’s not completely certain this artifact is of Clovis age. If this is the case, the blood residue originated from a modern bison (Bison bison). It’s also possible, but not likely, that the blood was from a woodland musk-ox (Symbos cavifrons). Woodland musk-oxen did range as far south as Louisiana and Mississippi, but no fossils of this species have been found in South Carolina, Georgia, or Florida. I suspect woodland musk-oxen migrated up and down the Mississippi River Valley and did not range this far east. My photo of the long-horned bison skull found at Clarks Quarry near Brunswick Georgia and housed at Georgia College in Milledgeville, Georgia. The photo doesn’t really do the size justice. A man could hang a hammock between the points of the horns and rest comfortably inside. The first radio-carbon date on this specimen was 14,000 radiocarbon years. It has since been redated to 21,000 radiocarbon years. A specimen of a long-horned bison (Bison latifrons) found at Clark Quarry near Brunswick, Georgia was radio-carbon dated to 14,000 years BP. Paleontologists think Bison antiquus evolved from Bison latifrons about ~24,000 years ago. Based on this find, I speculated that Bison latifrons co-existed with Bison antiquus in the southeast much later than scientists thought. However, I recently learned this specimen was radio-carbon dated a second time, and the result was more in line with scientist’s assumptions. The new date for the specimen in the photo is about 24,000 calender years BP. Both Bison antiquus and Bison latifrons were at least 25% larger than modern bison. Bison latifrons had the longest horns of the 3 species, while modern bison have the shortest. The extinct species of bison were likely much fiercer than their modern descendents and were built for fighting off lions and saber-tooths. This photo I took of a road-killed bobcat a few weeks ago seems like an appropriate aftermath to the horrors of Halloween night. The automobile that ran over this poor feline was certainly a monster from the perspective of a cat. This bobcat was a beautiful specimen before vultures started pulling away the guts. I believe it was a large male and in person the coat seemed more grayish than it does in the photo. If one clicks on this photo to enlarge it, the blow flies are visible. This is only the second wild bobcat I’ve ever seen and the first road-killed specimen I’ve encountered. The heavy early summer rains this year were beneficial to the rabbit population and hence bobcats had a good year as well. It’s an impressive predator, and a Pleistocene survivor (See: https://markgelbart.wordpress.com/2012/09/20/the-bobcat-lynx-rufus-another-pleistocene-survivor/. The carcass was located on Highway 56 in Richmond County, Georgia 2 minutes north of the Federal Paperboard factory by car. Now, 19 days later, all that remains is a few tattered pieces of hide. This is an example of just how rare the process of fossilization can be. In less than 3 weeks almost nothing of this magnificent animal remains. Some species of large mammals in Georgia had annual populations in the tens of thousands for hundreds of thousands of years, yet we have very little evidence that they ever existed in the state. In the entire piedmont region of Georgia there are only a few scraps of bone from deer, bison, mammoths, and mastodons. There are no carnivore fossils from this region dating to the Ice Age, but we know they must have lived here because there are jaguar and wolf fossils in the mountains and coastal plain, and many more carnivore fossils in South Carolina, Florida, Alabama, and Tennessee. The process of fossilization is simply a matter of chance. A coyote carcass lay not far from the road-killed bobcat. I didn’t take a photo of it because road-killed coyotes are more commonplace. 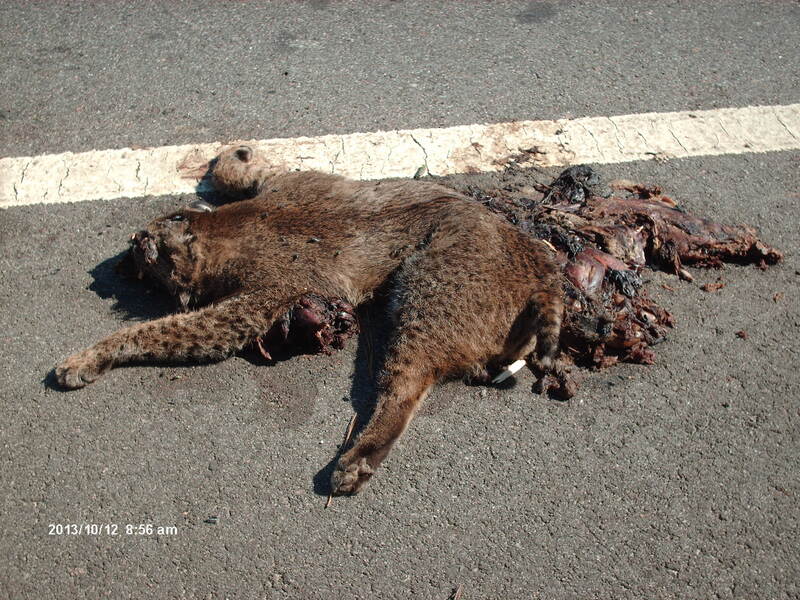 Coyotes are more willing to scavenge road-killed animals while bobcats much prefer fresh meat. I think this explains why coyotes are more commonly sighted as road kills–they fall victim themselves while scouting for highway carnage. I didn’t see any road-killed deer along Highway 56 all summer, but suddenly I’ve spotted 4 on this thoroughfare. It’s hunting season so perhaps spooked deer are running far away from their normal stomping grounds, thus putting them at risk in unfamiliar territory where they don’t expect traffic. You are currently browsing the GeorgiaBeforePeople blog archives for November, 2013.